“Arty discovered the colour yellow this week. So sunny and bright! Everything was yellow, shapes, paint, bricks, balls, lots of different textures and interesting toys and other things to use in making a wonderful ‘creation’. Arty was a little bit hyperactive this morning. He enjoyed doing some painting and then he enjoyed running around the room much to my horror, but Helen was great, she put me at ease and told me that it’s okay, he’s just being a little boy and lots of children are like this. Not a problem at all. Phew! We painted our feet and made sunflowers. It was a lovely session and even though Arty was on the move a lot during this one, he still got lots out of the art on offer :)”. the whole session ahead. Right, down to business and today’s theme is the colour… Blue! Arty is excited. He sits straight down in his little red overalls and gets to work, smearing large splodges of blue paint all over a huge piece of wallpaper. He rolls blue balls through the paint and he paints blocks with letters of the alphabet raised on them, then prints them onto the paper and we say each letter as he does it and encourage him to have a go too. Helen tells us to ask him what colour the sky is, what colour the sea is and then we start to make ‘sea’ and watery scenes onto smaller pieces of paper for what will be our aquatic picture scene. Arty is given tissue paper and we roll it into little balls and use PVA glue to stick them onto the paper as well. We cut little pieces of coloured paper, triangles, circles and then we also stick them onto the picture. Arty is encouraged to have a go. He loves cutting and sticking now and he didn’t know how to do this before. He is really keen to try now and is better every week. We went home with a very nice, colourful ocean scene picture. And a very proud two and a half year old. I love how Creation Station encourages parents to get involved and sees the importance of developing parent creative skills and confidence in doing Art with their children. We also, feel a huge sense of pride and building bonds with our children and understanding their individuality and needs.”. Here are some fun ideas to make your own funky creations to personalise your stationary and pencil cases or bags. 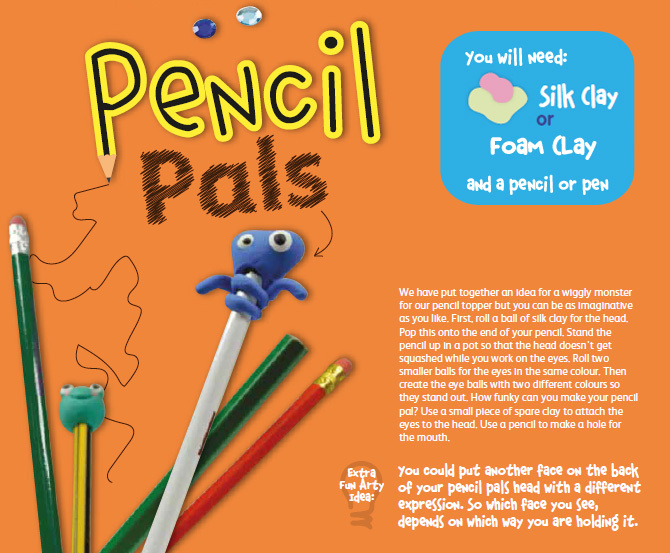 Have a go at making some of your own fab pencil topper pals. What different characters can you create? We would love to see photos of your creations, please share them on our Facebook page or email hello@thecreationstation.co.uk. 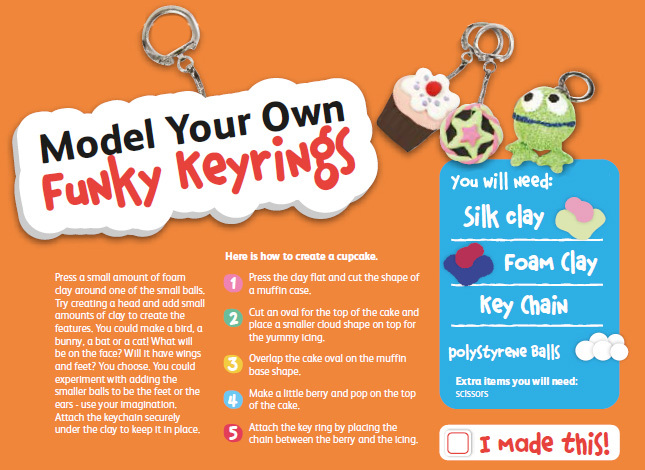 Did you love making your pencil toppers why not have a go at some designer key rings. You can find all the products you need to make these fab creations on www.thecreationstationstore.co.uk. Looking for more fun ideas? Become a follower of our blog and sign up to our weekly newsletter for ideas, top tips and special offers. Here are some top tips to help ease the transition for you and your child. Ask them what questions they have about school. Let them know what to expect from the first few days. Encourage them to talk to other children and to take all concerns to a grown up, they shouldn’t be worried about speaking up about anything no matter how small. Teach them to recognise their own name, they may not be able to read or write but they will need to recognise their name to find their coat peg, tray etc. Write their name out and type it out, then stick those up for them to see so they can still recognise it in different styles. Ask them to find their name amongst lots of other words. Make it fun and turn it into a game. In the build up for the first week try to practice the routine with bed times and mornings. Try doing a couple of sit down activities at the table to start to get them used to sitting in a classroom. This could be reading a book together or doing some drawings. Stay only as long is necessary, once they feel comfortable it is time to go. The quicker you leave the easier it will be for them to settle down and understand the environment without you. Try not to cry in front of your child as this could upset and confuse them, especially as you’ve been telling them how great big school is and that they will love it! If needed, say goodbye and go and have a good cry outside with a friend! Say hello to the other parents and arrange a meet up, you could maybe go for a coffee straight away. All the other parents are in the same boat as you and also feeling a little unsure, they will be looking to make friendships too. It’s just as important to build solid relationships with the other parents as it is for the kids to become friends, after all, you will probably be around each other for many years if the class moves through the school together. Ask your child every day what they did at school, encourage them to share their thoughts and feelings and retell what they have learnt, this helps them to process information and embed it in their mind. Keep some of the best drawings and photos of the projects your child completes, in a “My First Year of School” scrapbook, which both you and your child could write in together. They can add more of their own writing and drawing as their ability develops, which in itself will be a fantastic record of achievement! Be sure to add the photo of them on their first day and finish off with another on their last day. They will have grown so much and it will be a lovely memory keepsake of this very special time in their life! 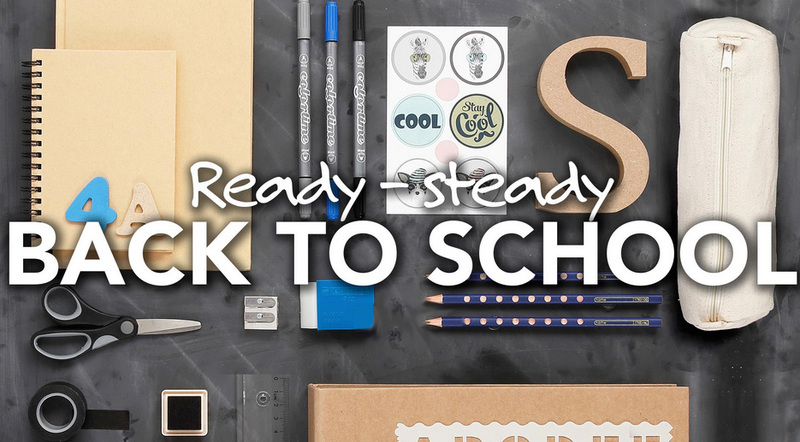 We would love to hear all about your child’s first day. Share your stories on our Facebook page.